Anywhere you travel and visit an Air Force Base (AFB) or Forward Operating Base (FOB), you will be glad the HVAC/R is working. 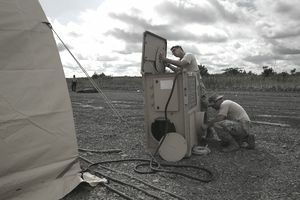 Heating, Ventilation, Air Conditioning, and Refrigeration specialists are worth their weight in gold especially when deployed to desert or cold climates. The HVAC/R Specialist installs, operates, maintains, and repairs heating, ventilation, air conditioning and refrigeration (HVAC/R) systems, combustion equipment, and industrial air compressors. Maintains and repairs nonelectric kitchen equipment. Manages HVAC/R functions and activities. Related DoD Occupational Subgroup: 720. Installs and operates HVAC/R systems and equipment. Interprets drawings and schematics, and installs HVAC/R components. Installs, repairs, fabricates, and tests piping and tubing systems. Installs, connects, troubleshoots, and maintains HVAC/R controls. Tests HVAC/R equipment for proper operation. Balances air and water in HVAC systems. Monitors systems operation to ensure efficiency and compliance technical orders, manufacturer handbooks, local procedures, codes, and directives. Evaluates water treatment for heating and cooling systems. Ensures compliance with safety and environmental regulations for fuels, refrigerants, and hazardous materials. Maintains, and repairs HVAC/R equipment and systems. Performs recurring maintenance and seasonal overhaul on systems and components. Uses drawings and schematics to analyze and isolate system malfunctions. Troubleshoots malfunctions. Repairs or replaces components. Modifies equipment for specific missions or to increase efficiency. Maintains tools and equipment. Maintains shop tools and equipment. Knowledge. Knowledge is mandatory of: principles of HVAC/R systems, controls, and components; combustion systems; air and water balancing; nonelectric kitchen equipment; industrial air compressors; interpreting drawings and schematics; fundamentals of HVAC/R equipment and troubleshooting techniques; industrial water treatment; environmental regulations for fuels, refrigerants, and hazardous materials; and military and commercial publications and environmental regulations. Education. For entry into this specialty, completion of high school with courses in mathematics, general science, physics, shop mechanics, electricity, and computer fundamentals is desirable. Training. For award of AFSC 3E131, completion of a basic HVAC/R course is mandatory. 3E151. Qualification in and possession of AFSC 3E131. Also, experience in functions such as operation, maintenance, and repair of HVAC/R equipment and control systems. 3E171. Qualification in and possession of AFSC 3E151. Also, experience performing or supervising functions such as operation, maintenance, and repair of HVAC/R equipment and control systems. 3E191. Qualification in and possession of AFSC 3E171. Also, experience managing functions such as inspecting, operating, maintaining, and repairing of HVAC/R systems. For entry, award, and retention of AFSCs 3E111/31/51/71, qualification to operate government vehicles according to AFI 24-301, Vehicle Operations. Required Appitude Score: M-44 or E-33 (Changed to M-47 or E-28, effective 1 Jul 04).